Amidst the number of health issues that millions of North Americans are suffering from due to obesity epidemic, people are being more conscious about their diet. Individuals are encouraged to stay healthy by attempting to lose belly fat. Maintaining a good image is not about vanity but is about maintaining health. For your buddy to be able to function well and stay healthy, you need to eat healthy food. Your body needs the energy that it gets from food but there is a certain limit to that need. Excessive eating and food high in fat content would result into buildup of fat. People are unique and their body’s needs for energy , so the suitable number for calories intake vary. Gender, genetic disposition, level of physical activities during the day, age, height and weight are the factors that decides on how many calories are needed for each person to maintain a healthy weight. By knowing your body mass index you would be able to learn the approximate amount of calories intake recommended for you. There are many calculators on the net that helps you find out your BMI. Once you know what your current BMI is, you will know how many calories you need per day to maintain, gain, or lose weight. A BMI between 18 and 25 is considered healthy by most doctors and researchers. A BMI over 25 means being overweight and over 30 means obese. At the same time, a BMI lower than 18 is considered underweight. In general calories intake that averages between 2000 and 2500 is considered optimum for men. For women, calories intake averages between 1800 and 1500 cal per day. This is called weight maintenance caloric intake. The general rule is to drop 500 calories off the recommended calories intake according to your gender, age, and height. You can do that with a combination of dieting and exercising. You can lose about 1 pound of fat if you reduced your calories intake by 500 calories a day. Women go through hormonal changes all the time. Between child bearing age and menopause, female body goes through many cycles. A lot of women gain weight around the waistline during pregnancy and tend to keep it after child birth. Women going through hormonal imbalance or approaching menopausal could experience weight gain even they maintained the same diet and physical activities level. Even though many women focus on calories counting to lose weight, the truth is, she is battling with her hormones. Understanding the changes that female body chemistry goes through, can help ease a lot of the frustration experienced during weight loss attempts. A well balanced diet and exercise plan can help control and lose belly fat and keep it off. Do Sit-ups and Crunches Help Lose Belly Fat? There is no scientific evidence that sit-ups and crunches would give you flat abs. Exercising that targets the waistline does help tightening abs by building muscles in that area. Yet, sit-ups and crunches help lose belly fat, is a myth! 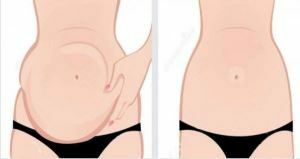 Men and women share this area where fat deposits. Fat layers go around waistline to expand it beyond health and good image measures. No matter what you call it; beer belly, pot belly, love handles, or spare tire the remedy is the same. Balancing your calories consumption with the calories your burn through healthy diet and a consistent exercise regiment is your sure way to lose belly fat and keep it off. A good deal of visitors are acquiring a very hard time seeking out the most effectual way on how to drop belly unwanted fat. Considering the fact that these fats are way very considerably deep in our body pores and skin, it could very well be genuinely very difficult to get rid of. Nevertheless, there are easy however helpful procedures to resolve this condition. By knowing these couple simple steps, you are a person step closer to your correctly toned shape. Interesting Thoughts, Are you embarrassed about the size of your belly? Do you want to lose belly fat and feel good about yourself? If you answered yes to both of these questions then you have stumbled upon the right article.